The Chevrolet Spark was just awarded the best possible score of five stars for its performance in the Korean New Car Assessment Program (KNCAP) crash test rating. The bow tie city car scored five stars in the front, side, and rear crash tests and also performed very well in the pedestrian and whiplash test, scoring four stars. “The outstanding performance of our new mini-car in stringent NCAP testing reflects our attention to safety as well as eye-catching styling and great packaging. GM has made safety a focus as part of our ongoing commitment to design, build and sell the best vehicles in the world,” said Jack Keaton, vehicle line executive for General Motors’ Global Mini-Vehicles. More than 66 percent of the Spark’s body, called the Matiz in South Korea and known as the Beat in India, is constructed of high-strength steel, with 16.5 percent comprised of ultra high-strength steel. The latter is predominantly used in the longitudinal member of the underbody as well as the front and center pillars in the side body structure. The Spark is expected to go on sale in the U.S. sometime in 2011. I currently own and drive a 2008 Smart ForTwo Passion Cabrio. 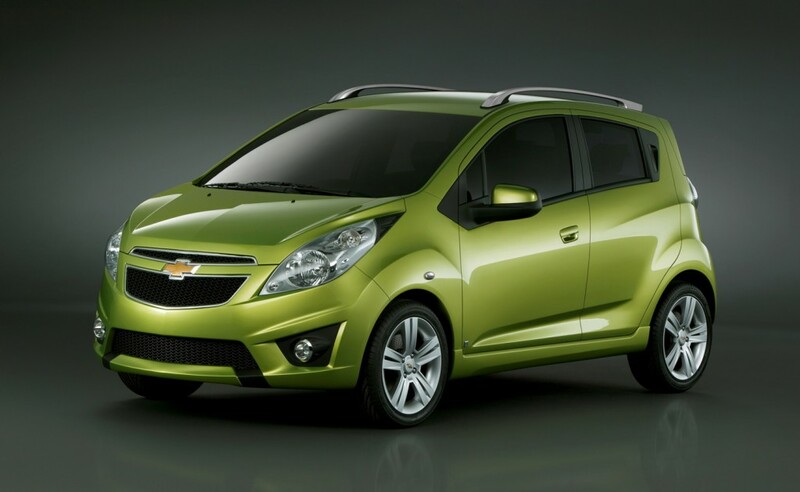 The Chevrolet Spark will be the car that will replace it. I am curious to know how the KNCAP compares with the NHTSA tests. From what I’ve heard, the two standards are quite different and don’t translate perfectly. But there was a case a few years ago where the Cruze scored 5 stars worldwide, including Europe, Australia, Korea, China, and U.S. We’ll see about this as we get closer to launch. The manual-matic transmission seems like something out of Jules Vern. A manual “clutch-type” transmission where an automated electro-servo unit opens & closes the clutch “automatically” when shifting (shifting is either done by the driver in ‘manual’ mode, or automatically in ‘D’ mode). As a person who loves to drive a stick, I hate it. Part of the fun of driving is using a stick & clutch together (IMHO). To take that away robs me of the fun & freedom I enjoy of driving a stick. Now, I don’t mean to bash this little car. It is fun to drive in the city & zip around, finding parking where others dare to go. The automated convertible top is a blast! But this is a city car & that’s exactly what it’s billed as. A friend of mine who lives in Olympia, Washington has had his Smart car & just loves it to this day without any complaints. So it’s an individual preference of what you want and are looking for. A personal comment: As you may know, the Smart Car is made by Daimler (Mercedes-Benz parent company). I’m stumped to understand Daimler’s reasoning that they’ll import the tiny Smart car thinking that there’s a market in America and yet not even consider offering the “A” or “B” class Mercedes in the United States. Especially when you consider the Smart only holds two people, wouldn’t you want to keep your customer in the Daimler family if they now have kids or now have more than two people? The small “A” class “Honda Fit” style hatchback would be a nice upgrade (again, IMHO). Nice description of the Smart. I didn’t imagine that the ride would be so harsh – but that’s what you sign up for when you get a Smart. You’re right about the A/B Class. They could be here, but I think there are two reasons for Mercedes not bringing them over here. 1. They may be afraid of what a smaller, less expensive vehicle would do to their reputation/image in the U.S./Canada – where Mercedes stands for ultimate luxury and prestige. Not sure how how far a $20k A/B would go in that regard. 2. Exchange rates. At the lower price point, it’s less cost effective for them to export from Europe, where labor rates are highest. They would probably consider introducing the A/B classes here if they could make them in North America (NAFTA comes into play here). That said, I love the A class. I was driven around in one in Italy for a full day as a taxi. Very cool design, space-efficient, and definitely does not feel “cheap.” If anything, it felt like the Mercedes-Benz of small cars! Well, as of 13 October 2010, I’ve heard from various sources that the U.S. won’t get the Spark until the 2013 model year. So we might not see it here until possibly the Summer of 2012. Too bad it won’t be any sooner as I’m in the market to buy one now. Oh well, maybe it’ll be significantly upgraded & worth the additional wait. Summer of 2012! By that time, it may be too late. This reeks of the “dumbstuff” GM pulled with the Cruze – launching it in Europe first but only making it available in the U.S. almost three years later.